Congratulations to Lauren & Brandon who were married at Keswick Vineyards on Saturday, September 20th. Once again, the weather was just perfect! Lauren & Brandon’s wedding was definitely a family affair with Brandon’s Aunt & Uncle being their officiants. You could just feel the love and emotions throughout the entire ceremony. Lauren definitely had a vision for her wedding day. I remember her coming for her walk thru and showing me some Pinterest photos of what she wanted. 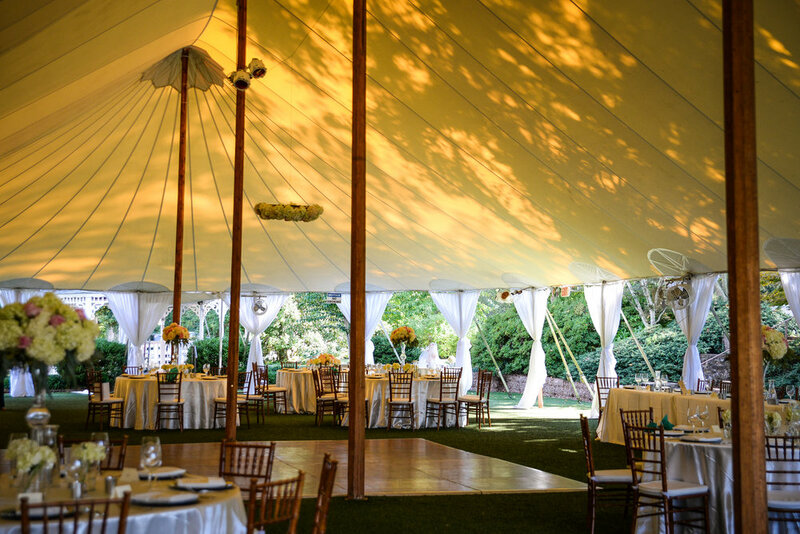 I love how she had the exterior poles of the Sperry tent covered with fabric. I was amazed at how just doing that created such a different feel and look to the tent. I would say it added a feel of elegance and sophistication. A very nice touch! She also had a halo of flowers hung over the dance floor. Special thanks to the following vendors: Caterer Harvest Moon, Event Planner Amanda Gray of Ashley Baber Weddings, Hayne Photographers, DJ Jay Iseli, Make-up Artist Charlottesville Makeup Artist, Hair by Claudia Salyer, Cake by Bake Love Bakery, A Goff Limo for buses, Rentals by Festive Fare, BBJ Linens and Skyline Tent Company. Click here to see more photos and read the blog by Hayne Photographers.